Celebrate 31 on August 31st! 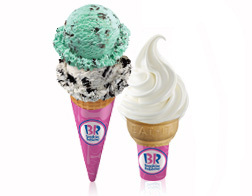 On August 31st, Baskin-Robbins is celebrating with $1.50 scoops at Baskin-Robbins! Offer varies in the greater Houston, TX, Fresno, CA, San Jose, CA and Detroit, MI areas. Call shops for details. Offer good on all scoops. Waffle cones and toppings are extra. Excludes sundaes. Cannot be combined with other offers. Click here to find a Baskin-Robbins store near you.